This book is a biography of a 7-figure e-commerce entrepreneur Ellen Lin who started her first business with $600 in her garage in 2011- starting from eBay… and to Amazon, Walmart, Jet, Rakuten, Sears, Lazada, TradeMe, etc. So this book is not only about how to sell on Amazon, but also how to build an international brand through global e-commerce channels and social media. 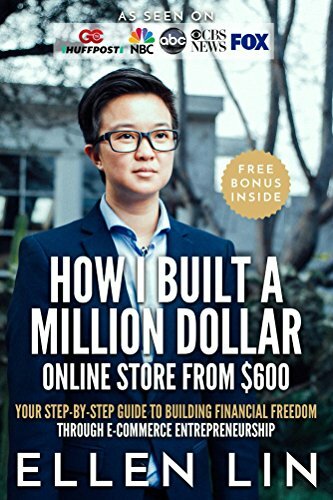 “How I Built a Million Dollar Online Store from $600” by Ellen Lin will be free and available for download on Amazon for 5 days (04/15/2019 – 04/19/2019) at: https://www.amazon.com/dp/B074YBYS2Z. “I highly recommend this book for anyone who is looking to make money on amazon or get started in selling products online. Ellen’s story is very inspiring and she breaks down her strategies in a very simple to understand format. She is also a very likeable person with a good heart and it shows in her writing.” – Amy P.